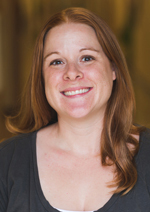 Whitney Bednarz has been the lead teacher in our Middle School program since 2012. Whitney is certified by the State of Michigan in secondary education and is currently completing the final stage of her Secondary I-II Montessori credential with the Cincinnati Montessori Secondary Education Program (CMStep). Whitney lives in Erie with her husband, Brian, and two children, Keelyn and Liam. Whitney enjoys gardening, cooking, woodworking, reading, and spending time with her family. Whitney Bednarz can be reached at wbednarz@meadowmontessori.org.